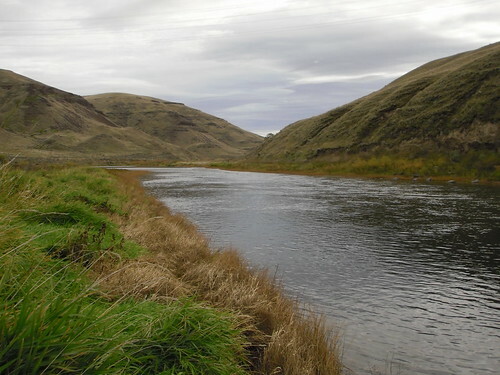 I have never fished the John Day River but I have always heard good things about its smallmouth bass fishing in summer and its steelhead fishing in the fall/winter. So for the second river in my steelhead fishing expedition I decided I should fish it. The biggest problem with the John Day for me is that it is to the west of me. That means I have to drive towards population centers, instead of away from them. Nonetheless, I thought I should give it a try. Just the drive over to the John Day is not as pleasant as driving to the Wenaha, Imnaha, or any other river to the south or east. I get to drive through forests and canyons on my way to these other rivers. The drive itself usually provides many good site-seeing opportunities. The drive to the John Day started out rather nice, but the views went down hill quickly. It had been a while since I had drove between Wallula and Hermiston and I enjoyed looking at the basalt bluffs and rolling, rocky hills with bunch grass. But soon that part was over and I was on the freeway. I was a little surprised when I arrived at the John Day river. I thought the river would be mostly empty since it was Monday. But I found several cars at the parking area. The John Day is good sized though and there was plenty of water so that no one felt crowded. The funniest part about meeting the people on the river was that four of them were from Walla Walla. I had met Tom Craig (a Walla Walla realtor) before and I talked at length to Dale McKain who drives the school bus my kids ride on, lives just up the river from me, and was one of the original owners of the fly shop in Pendleton. It’s a small world as they say. Looking at the John Day as I strung up my fly rod left me feeling a little lost. I grew up fishing creeks and small rivers and have rarely fished bigger water. When I am fishing the Imnaha I find it easy to pick apart the water and work my flies through the fishy looking parts. The John Day is wide and slow in this section near Rock Creek and I was having a hard time deciding where to start fishing. In this size of a river the runs can get super deep and so do the pools. Much of the river is deep. On a small river, steelhead usually look for depth, structure, or rough water for cover. Fishing the deepest spots on a small river is usually an easy way to find steelhead. On a big river, the deepest water is too deep to fish effectively. I soon got over my lost feeling and began working my flies through the spots that looked best to me. I covered a lot of ground as well. Since this was my first time on this section of water I didn’t spend too much time fishing any one spot. I fished a little hear and there and got a lot of ground covered, wanting to see what the general nature of the river and canyon were. About three miles upstream I finally hooked into a large steelhead. My flies were drifting through the middle of a pretty deep run when the steelhead took my flies and kept on moving. I nearly lost my rod it jerked it so hard. I regained my composure and got ready to do battle. 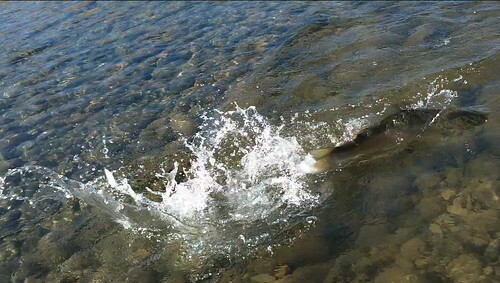 The steelhead made a dash for the other side of the run and leaped out of the water. And that was that. It did not break off, it simply came off. I worked my way upstream four or five miles before I turned around. I hiked my way back downstream fishing a run here and there but mainly trying to cover the miles back to my vehicle before dark. On my way back down I again met up with Dale McKain and we had a good conversation on the walk back until crossing the river at the parking area a steelhead swam up the river no more than three feet in front of us. Back at the cars I learned that I was the only one to hook a steelhead all day. I had also talked to three guys who floated the river and it didn’t sound like they had caught anything. I also spoke with a guy who was staying at a private cabin up the river who hadn’t caught anything. So I did not feel quite so bad for myself only hooking one steelhead. Fishing any river for the first time you can feel a little lost, but Tuesday morning I fished the John Day with a little more purpose. I worked my way upstream methodically fishing through the runs. One thing about learning to fish on small rivers is that I have grown accustomed to rollcasting a lot. In fact, I rarely overhead cast even if it is clear behind me. With the rod I have now, I think I can roll cast just about as far as I can overhead cast anyway. But the John Day is a little wider and I wanted to get a little more distance. I was fishing a weighted double bunny, a weighted stonefly, followed by a weighted egg pattern. Double Bunnies really add a lot of weight with all that fur so I decided to switch the bunny out for a weighted olive woolly bugger. Switching to the woolly bugger added some distance to my rollcast and about a mile up the river I was rewarded with a small wild steelhead. After releasing her I began fishing and about 20 feet downstream from where I caught the first, a second steelhead took the olive woolly bugger. This fish was bigger, stronger, and more acrobatic. She made four leaps out of the water in the first 30 seconds of being hooked. After an additional two more leaps I brought her in and let her go. The John Day was looking better. Battling steelhead is a little easier in a river like the John Day. There is a lot more room for the fish to run around, the current isn’t nearly as fast, and the river isn’t covered with large boulders that a fish can go under or around to break you off. Even if a fish did go for a run downstream, the bank of the river is much easier to walk or run down than the Imnaha. I continued my way upstream without catching anymore fish in the runs. While walking by an almost glass smooth section of water I decided I would throw my flies behind a few of the submerged boulders that were creating boils in the water. First rock I threw my flies behind and I had a steelhead roll back and began shaking its head trying to dislodge my egg fly. It came off fairly quick. I cast again to the same rock and what do you know? . . . Fish ON! I couldn’t believe it. It didn’t seem sane to me that it would be the same fish, but the rock they were behind was not very big. Either way it was my fourth hook up for the day and after several leaps into the air and a few runs, I had my third wild hen to hand. I fished my way up another mile or so to the good run that I had hooked a fish in the day before. The flyfisherman who was staying at the cabin on the hill above the run was already fishing it. After exchanging reports for the day (he had one steelhead on for the day) and fishing the run with no success I headed back downstream towards the car. I fished sporadically on my way back downstream but decided to fish the productive run from the morning a little more thoroughly. Just about exactly between where I hooked my first and second fish that morning another steelhead took my fly and began shaking his head before making a short run and coming off. 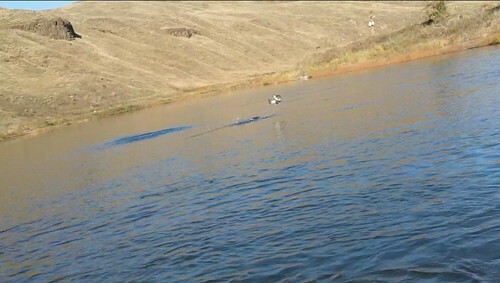 That made 5 fish hooked and 3 landed for my second day steelhead fishing on the John Day River. I will be back to the John Day again to try and learn more. It is hard to find much more contrast than fishing the Imnaha one day and the John Day the next. The Imnaha was running about 160 cfs to the John Day’s 480. The lower five miles of the Imnaha is tumultuous water running through vertical rock faces while the John Day is meandering along through rolling hills. I did enjoy the more relaxed methodical rhythm of fishing the John Day. This morning as the sun broke over the hills the air was filled with the singing of birds and I felt like I was enjoying a little bit of paradise. This entry was posted in John Day River, Steelhead Marathon 2010. Bookmark the permalink. Glad you got your feet wet in the JD River. It is a great place to go, hide, and search for steelies. Grant it was nice to have met you on the river, hope to see you steelhead fishing again soon. 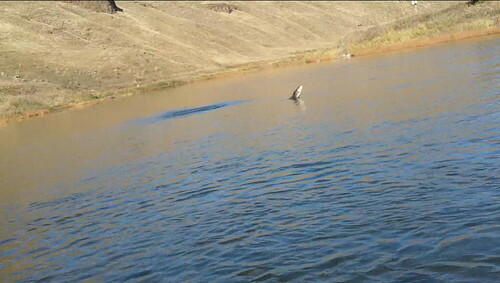 Great report on the John Day…I have to get up that way next spring. I especially like the fact that you went back to that same rock and landed a fish! Perseverance!! !